Welcome to Coconino County, Arizona! To find out "What's New" at this site, click here. Coconino County is the second largest county in the United States and is the largest in Arizona yet it is one of the most sparsely populated. Its 11,886,720 acres (18,562 square miles) lie in central-northern Arizona on both sides of the Grand Canyon with Kanab Creek and a portion of the Colorado River as its western boundary. The land lies in the central region of Northern Arizona and is covered with forests of pine, spruce, pinon, aspen and oak. There are deep canyons and steep mountains. The area is relatively virgin territory since it is not easiliy accessible. Coconino is largely an agricultural, lumbering, and livestock area. The county names comes from the Coconino Indians, of whom today's Havasupai are descendants. Lt. Lorenzo Sitgreaves interpreted the name as Cojnino, a not very great departure from the name Cosninas, as noted by Fr. Francisco Garces in 1776. Actually, the word is the Hopi designation for Havasupai and Yavapai Indians. Coconino County has a relatively large Native American population at nearly 30% of the county's total population, being mostly Navajo with smaller numbers of Havasupai, Hopi, and others. Nomadic hunters from the Great Plains made their way to the Little Colorado River approximately 12,000 years ago. That movement gave rise to the Anasazi culture which spread across the Colorado Plateau. , which encompasses a large part of Coconino County. By the 1600's, tribes consisted of the Hopi, Havasupai, Pai (Yavapai and Walapai) and the Paiutes. In the 1850's military expeditions passed through the area between the Little Colorado River and the Verde River. In 1857, Edward F. Beale, an ex-Navy Lieutenant, led an expedition to survey the unexplored territory between El Paso, Texas and the Colorado River, which was later most notably associated with the legendary “Camel Experiment”. The “U.S. Camel Corps” was born on March 3, 1855 when Congress appropriated $30,000 for the project that funded the procurement of camels to be used by the U.S. Army in the “Great American Desert”. Beale was allotted 25 camels and they proved to be worthwhile despite their foul smell, bad tempers, and kicking and spitting. The camels were “retired” in 1863 and Beale was honored with a wagon road named after him. Settlers migrated into the region from the north during the 1870s and 1880s. Mormon settlers first set up camp at Lee’s Ferry on the Colorado River and continued on to Fredonia, Jacob’s Lake, Tuba City and Mormon Lake. In 1883, the Atlantic & Pacific Railroad was completed across Arizona and westward. Logging and cattle ranching were the major industries. Coconino County was carved from Yavapai, one of the four original counties in Arizona. In 1887 William H. Ashurst of Flagstaff introduced a measure in the 14th Territorial Legislative Assembly to create "Frisco County," but the measure was defeated. The following year Frank Rogers took up the fight, and introduced the bill again in 1889. The 15th Territorial Legislative Assembly passed a bill to establish Coconino County, only to have it vetoed by the Territorial Governor. The House then passed over the veto, but the Senate failed to follow through. 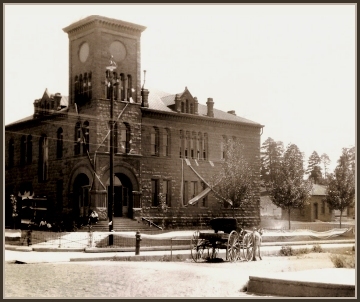 By 1891 the time was right for the creation of Coconino County and on February 19, 1891, it came into being. You are the visitor to this site since April 3, 1997. AZGENWEB, Coconino County, Arizona: In keeping with our policy of providing free information on the internet, data may be used by non-commercial researchers, as long as this message remains on all copied material. These electronic pages may not be reproduced in any format for profit, nor for presentation in any form by any other organization or individual. Persons or organizations desiring to use this material for purposes other than as stated above, must obtain express written permission from the author, or the submitter and from the listed Coconino Co. Coordinator.